Plate size 2 1/4 x 5 1/8 inches. Sheet size app. 5 1/2 x 8 inches. “I drew this etching from the top of the Lyon Street steps in the Pacific Heights neighborhood, one of the most beautiful hilltop views in San Francisco. During the time I drew it, walkers and runners of all ages climbed the steps and many people just came to take pictures. 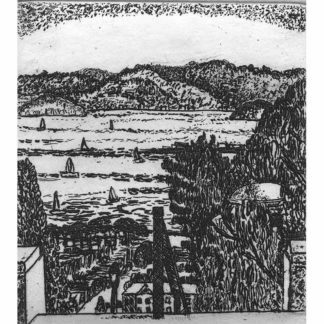 The steps’ railing is in the foreground, the 1915 Palace of Fine Arts is visable, as are the Marin County hills, as sailboats sail in the Bay. Each print is a numbered, limited edition, handmade piece of art. 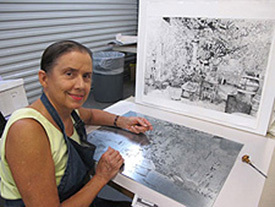 I create my metal etching plates using 17th century tools & techniques including making the original drawing in wax which is destroyed during the process of etching with acid. I do finish work by cutting the metal by hand with a burin (engraving). Each plate is then individually hand-printed. 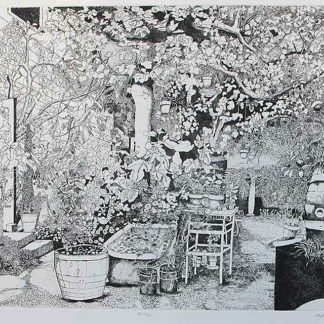 I work extensively in etchings of plants, landscapes, and seascapes. 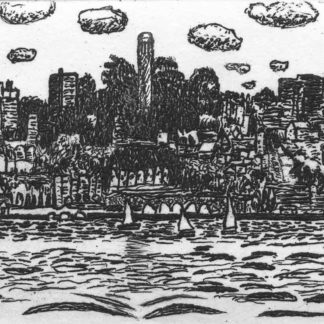 This notecard is a reproduction of my original etching and engraving.